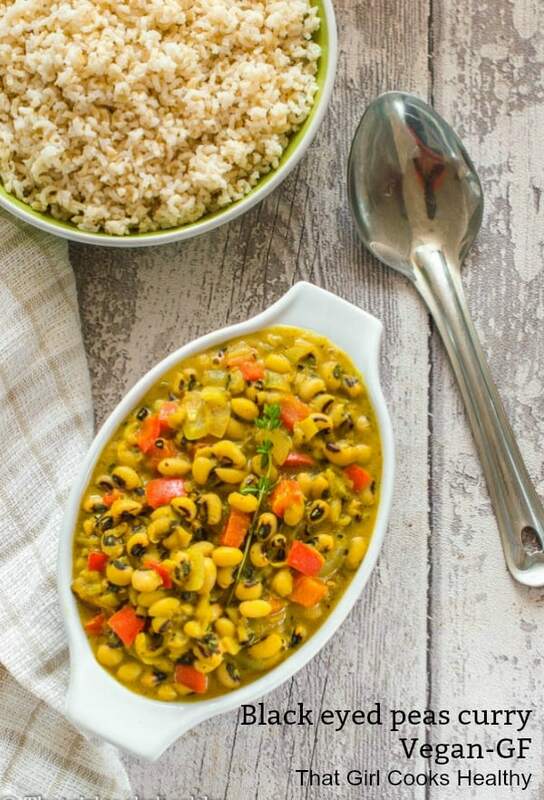 Black eyed peas curry – this delicious one pot Caribbean style curry is so flavoursome and prepare to make in batches and serving on busy weeknights. 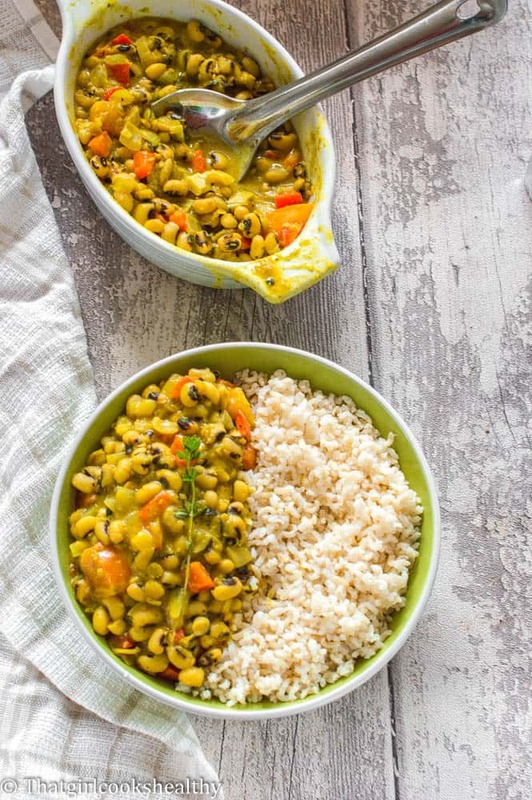 Growing up Caribbean meant eating copious amounts of legumes and pulses so if you’re looking for a Caribbean style curry that’s full of flavour, vegan and not difficult to put together then this black eyed peas curry is for you. Contrary to the name black eyed peas, are actually legumes and not garden peas. In the Caribbean most English speaking islands prefer to “beans” as “peas” which can sometimes cause confusion. However, in this instance this legumes is often referred to as a pea by default. The name denotes from having a creamy coloured exterior with a black spec which resembles an eye. 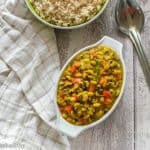 You can find recipes from Trinidad and Tobago such as Pelau rice or Accra which is a type of fritter eaten in the Caribbean and West Africa which is commonly includes black eyed peas for some variations. I made this black eyed peas curry on a regular basis before I finally thought it was good enough to share. Behind the scenes there was plenty of trial and error of ingredients. It was a case of achieving the correct quantity so the right notes could really compliment each other. Now I’m happy and confident enough to reveal this delicious one pot/pan meal which can be made in bulk in less then 30 minutes. The great thing about this recipe is that you can cook it multiple ways – on a stove top, using a pressure cooker or instant pot. Dried vs canned legume – which black eyed peas to use? It’s really a matter of convenience and what works best for your lifestyle. I believe there are pro’s and cons for both sides of the spectrum. The most obvious thing to note is that dried beans can be purchased in a quantity for a cheap cost and last for a long time. I totally get the advantages of buying dried beans, it’s cheap, cheerful and last for quite some time BUT…. because dried beans generally soaking or at least cooked before hand more often then not, this can deter people from preparing a meal that uses dried beans. Canned legumes are the most obvious choice if you’re pushed for time or simply don’t want to be in the kitchen for too long. I totally get it, been there myself! However, most canned beans are loaded with refined salt, which is bad for out health and also end up being more costly. You can cook legumes in bulk and freeze them!! Yes, it’s the best solution to saving time and money. I would advise storing the legumes in small containers or freezer bags and not freeze the entire bath so they can quick defrost at your leisure. The legumes generally take up to an hour to cook, so it’s not very time consuming at all. They will be soft and easy to squash using your finger tips when done. I don’t own an instant pot so I tested this recipe by stove top and using Pressure King Pro which works very similar to an instant pot. What I did was saute the base ingredients first – onion, scallion, ginger and garlic. My pressure cooker pro doesn’t have a sauteing option so I switched it on and selected the 99m option which I believe is the slow cook button on the newer model to heat the pot. When sauteeing the base ingredients, the lid should be off and use 2tbsp of coconut oil to lubricate the surface. The pot heats up quite quickly within a minute actually so it’s best to sautee for about 1-2 minutes with the pressure cooker on before turning off as it continues to heat through. You can then add your other ingredients – red bell pepper, tomatoes, thyme, coriander, black pepper and curry powder. Just combine everything together and move side to side with the pot turned off. Switch the pressure cooker on and add the 1 1/2 cups of uncooked black eyed peas, scotch bonnet and coconut milk to the pot and stir. Select the stew/soup button. Place the lid on, turn to lock and set the valve knob to seal and let the pressure do it’s magic for 25 minutes. When the timer goes off, leave for a few minutes before turning the valve knob to the venting position so the steam can release. Remove the lid and discard the scotch bonnet. Switch your instant pot on and select the saute button (normal). Proceed to saute the base ingredients – onion, garlic, scallion and ginger for one minutes. Then fold in your bell peppers and spices. Finally mix in the black eyed peas, tomatoes, thyme, scotch bonnet and coconut milk. Turn the sautee option off, put the lid on and lock your instant pot then turn the valve knob to sealing. Once the timer is up, leave the pot to release some pressure for a few minutes before turning the valve position to venting to release the rest of the pressure. Can I use dried black eyed peas in my pressure cooker/instant pot? Yes, you don’t necessarily need to soak the beans overnight if using your pressure cooker. The whole meal will come together in 30 minutes, enjoy! I don’t like coconut milk, can I use an alternative? Promotes high levels of haemoglobin, an iron rich protein, helps transport oxygen to the cells and around the body. Potassium helps to regulate the bodies blood pressure levels. A cup of black eyed peas is 20% of your daily requirement. Add your tomatoes, black eyed peas, spices and then finally your coconut milk before bringing to the boil and simmer. 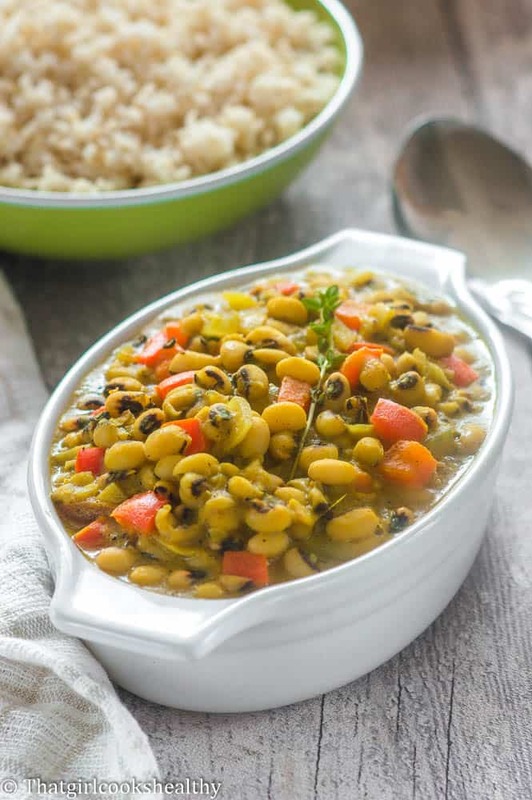 Learn how to make this quick and easy black eyed peas curry – instant pot friendly!! Saute the onions, garlic, scallion and ginger in a large skillet/frying pan on medium heat. Add the black eyed peas, pour the coconut milk into the pan and season with pink salt and black pepper then bring the pan to a rolling boil. Wow…will try this tomorrow. I love easy to prepare meals. And this is soo healthy. Thanks for sharing. Looks absolutely divine! I definitely need to add this recipe into my rotation! Love the step-by-step pictures and that you provided a 30-minute alternative with a pressure cooker! Oh boy do I love the similarities between Caribbean and west African cuisines. My mum makes such lush black eyed peas and this recipe reminds me of hers! Thank you! I can definitely relate to West African cuisines, love them too!! 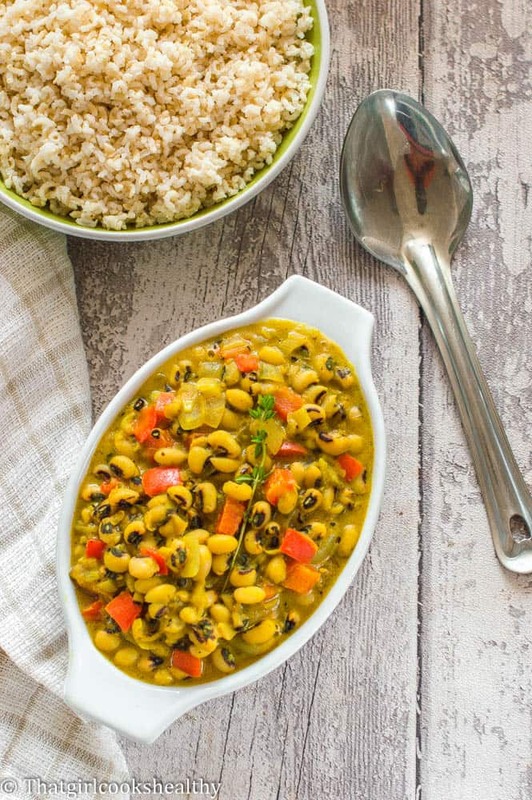 I always love a good curry dish and using black eyed peas sounds so good! Hi Rosemary, my apologies! I have updated the post as this was a typo. It should be 1 1/2 cups of uncooked beans that is needed.